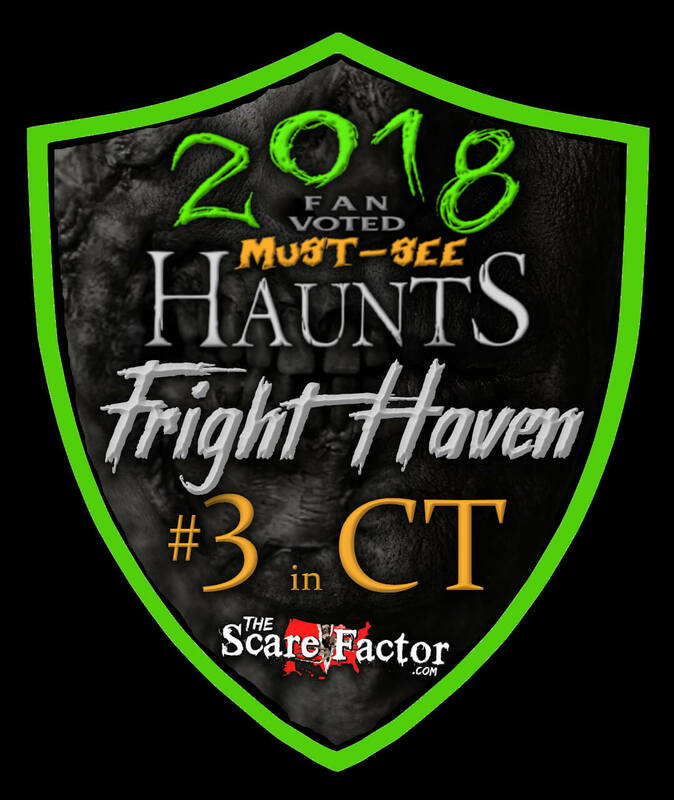 Fright Haven is a Haunted Attraction located in Stratford, CT. Team Hallowoosh reviewed this attraction on September 24, 2016. 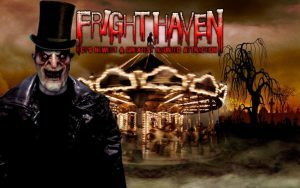 New England was first introduced to Fright Haven in 2007 in West Haven, Connecticut. After two heart-pounding seasons they were forced to close their doors due to a decrepit building. Now, eight years later, Fright Haven is (for lack of a more creative thing to say but so much fun to say) BACK FROM THE DEAD!!! Now, they’re in an all-new location in Stratford at the old Bally’s Total Fitness facility in Stratford Square (or, as owner Charles Rosenay likes to call it, “Stratford Scare!”); talk about getting a great location! The whole building is used for the haunt. Everything from the secured glass reception booth to the tiny little offices to the locker rooms, each area has something in store for you. Here you will enjoy three haunted walkthroughs: The Dead End Manor, Frightmare Fear Institute and Carnival of Evil in 3D. I have to say that the thought of a haunt that only lasted two seasons almost a decade ago sounds like it wouldn’t be worth the trip. As a haunt tourist I can honestly say I was very impressed with the work they do. A total of fifty volunteers is said to put on the show at Fright Haven. At times it is hard to tell how many actors are around. Some actors will slap a wall and scream as loud as they can while others go for a more creepy, silent approach. Both strategies can work in my book just so long as I realize they are in the room with me. The actors that stand out are the ones who engage with you; for a haunt full of volunteers, there was no shortage of engaging characters. My favorite were the clown twins at the very end of the haunt, forcing me to do push-ups or shouting at each other over what name they want to call me or rocking me back and forth shouting, “I Love You!” It got kind of weird but totally in a good way. I’ll never forget Dollady in her broken porcelain mask and doll dress. She told me she killed her brother because he made her mad, so now I get to play with her. You’ll see the mad butcher early on in the haunt while walking through a kitchen completely covered in blood. The butcher will run around trying to slice you open the whole time while you try to escape witnessing the damage he’s already done. Finally, Fat Freddy collects your tickets and reads over the rules for you before you enter… that is, after he shares a few entertaining, choice words with you and your friends. Other than Fat Freddy and Dollady I don’t remember seeing anyone in a mask. All faces were painted either in blood and scars or as grease-painted circus characters. The majority of the cast wore full costumes for their respective roles. The quality of the costumes themselves was on the low side but it did not take away from the effect. I can easily see a cheap brand costume with a bit of blood splattered all over it and it works. My favorite costumes were in the Carnival of Evil. Some clowns were painted up to blend in with the walls as you pass by. Most clown themed haunts I go through the actors either have a mask or look a little too traditional, in the evil clown sense. These clowns were painted a little more cartoony and with brighter neon paint so you can really see the expressions on their faces. A portion of the proceeds go to the Stratford Police department who are on scene every night along with members of the fire department. The facility is wheelchair accessible. They have a huge parking lot with free parking and more signs slapped all over the area than you can understand. Just in case you find yourself in the Stratford Square parking lot trying to find Fright Haven, just look west. If your eyes don’t find the giant 18 wheeler with a Fright Haven sign hanging over the whole length of it, then you need some serious help. Charles Rosenay is always happy to talk and chat with anyone coming through. The one thing that did feel a little weird is the glass in the ticket booth that gives the impression someone has tried to violently break in. The more awkward thing about it is that with the music playing it is hard to understand what the ticket cashiers are saying and vice versa. Right before you are done with the haunt you can get your fortune read or a cool looking temporary tattoo. Spider webs, spider webs and, oh yeah, spider webs. I love a good web casting myself but this stuff was almost everywhere. It is nice to break up the black background a little bit. They even have a giant spider scene that just rubs it in your face in case you didn’t get the message. Fright Haven loves spider webs! The haunting music plays throughout the whole haunt as a general sound for each attraction. Screams from across the haunt can be heard and add a little ambience to the experience. I will say it was a little confusing as to when I was in the Institute and exited the Manor. Although you know exactly when you are in the Carnival because a girl needs to give you 3D glasses. It was a relief to see a straightforward Carnival in 3D. Too many haunts overuse the airbrush art on the walls and sometimes it’s nice to just see bloody hand prints pop out or bright neon painted doors. There are a few endless hallways that look great with zombies in them. A few air cannons and maybe some clappers will give you a small jump scare. One particular actor gets the pleasure of bashing a piano as you walk by. The sound of their scream mixed with the sound of an old grand piano when bashed is a new kind of fun for me. Then there’s the pit. At some point during the Institute you will be asked to “walk the plank”. You have maybe six inches of walking space to make your way across the board without falling over. The effect is completely nerve-racking as it truly looks like you could fall down a pit. 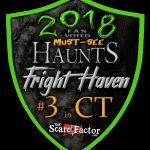 Fright Haven now has three themed attractions all connected to one walkthrough. Fat Freddy introduces you to Dead End Manor. The story of Dead End Manor in short is a vampire family that moved into a deserted house and invited the town over for a costume party. The morning after there was nothing to be found but blood all over the place. The attraction works a good general haunted house theme but I don’t remember any vampires. The Frightmare Fear Institute doesn’t have a backstory so much as it has a theory of fear to set up for its elaborate “Fear Pit” scene. You are clearly in an institute or asylum theme in this attraction. The Carnival of Evil is the longest. The story of this haunt is that it is made up of a bunch of retired carnival folk who band together to make their own show. Can’t argue the case that it feels like a big carnival fun house in there. The volunteers put on a good show. There are definitely moments when they can’t scare you but they give you a little something to take home… entertainment. Dollady is a great example of how much fun an actor can be to hang out with in a room for a little while. Piano slammer combines a classic jump scare and weird noises together to give a little taste of two worlds in one scare. The Fear Pit will never be forgotten, putting you on the edge (literally)! The two clown twins getting me to do a few extra things was a special way to make the night memorable. At the door a general admission ticket is $25. You can save yourself $5 if you purchase tickets online. The attraction takes maybe 12 minutes to walk through. T-shirts are available for $10 at the booth. VIP tickets are available for $40 and Special VIP for $50 which gets you a t-shirt and VIP pass. Ticket prices may seem a little high but for a volunteer haunt running out of a huge building, I can see great things happening here in the future! This place is amazing!!! I don’t scare easily, but this place had me jumping!!! The designers are …show more amazing at what they do! Everyone I’ve ever seen go LOVE it!!! By far the best haunted attraction I’ve EVER been to!